Written by Garth Ennis, David Lapham, Simon Spurrier and Jamie Delano, art by Jacen Burrows, Leandro Rizzo, cover by Jacen Burrows. 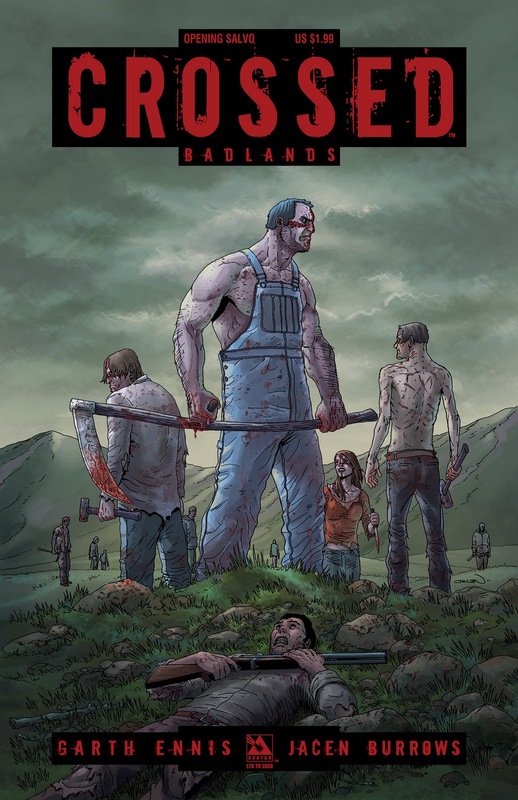 The first look at the new ongoing Crossed series, Badlands is here! Garth Ennis’ groundbreaking survival horror series has turned the comic community upside down with its unspeakable and unforgettable imagery. The Crossed Badlands preview edition provides a sample of finished pages from #1 along with an interview from the Crossed team of Garth Ennis and Jacen Burrows, and a rare peek inside the upcoming on-going bi-weekly series featuring story arcs by Garth Ennis, Jamie Delano, Simon Spurrier, and David Lapham! Along with an interview from Crossed artist Jacen Burrows. 2012 will be the year of the Crossed and this is your chance to stake a claim on the first startling images from the violent onslaught to come! This edition is limited to 5,000 copies! Due January 2012.